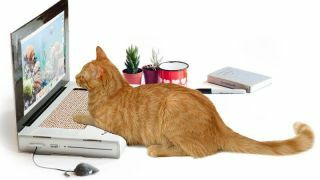 UK-based online retailer, Prezzybox, has developed a scratching post with a twist. If you own a cat, you'll understand that they are unavoidably attracted to the warmth of laptop keyboards. They'll think nothing of using your keyboard as a glorified heating pad. This usually happens when you're Skyping your special friend, or writing that 2am urgent last-minute presentation for your boss the next day. The 'Kitty Laptop' (sadly, it doesn't appear to be available outside of the UK) will let you twin with your cat without any of the risk of letting it play with your super expensive tech. Just don't be surprised when the cat eschews the cold cardboard shell for your superheated laptop once again. Yes, it's quite possibly one of the strangest pitches we've ever received. Also, is it just us or is the Photoshop job on that top picture a little too obvious?